It was a thrilling championship game of the USA Hockey Adult National Championship Tier 1 Over 50 men’s hockey tournament Sunday, April 13 in the suburbs of Tampa, Fla. When it ended, the Sun Valley Suns 50-and-over men’s hockey team hoisted the Tier 1 championship trophy for a second consecutive year at the Brandon Ice Sports Forum. Suns 22-year veteran forward Johnny Miller scored the game winner with nine seconds left in the 15-minute sudden-death overtime period as No. 3-seeded Sun Valley upset top-seeded Heartland Hockey Camp from Minnesota by a 2-1 score. “Right side of the goalie, short side, he snapped it underneath the crossbar—a great shot, so fitting because he had played so hard, an unbelievable way to finish,” said Suns coach John Burke about Miller. Facing a longtime nemesis in Heartland goalie Jeff McMurchie and going up against a stacked Heartland team that had won adult national titles in 2008 and 2010-11, the Suns trailed 1-0 as time ticked away on Florida sheet. But Duluth’s Tim Schnobrich, who played for Mankato State University in the 1980s and had a long and successful stint in Europe, scored the equalizer with 30 seconds left in regulation on a rebound—with Suns goalie Tony Benson off the ice in favor of an extra attacker. Schnobrich coached boys’ hockey at Proctor High near Duluth for 10 years through 2012, five years as head coach. Burke called him a “helluva hockey player,” who got to play at age 49 through a tournament-approved age exemption. All players in the Over-50 No Check National Championships must be 50 years of age or older except for goalies, who may be 45 years of age or older. Successful penalty killing by Miller and native Canadian Dave Moree, 50, from Richmond, B.C. and Northern Michigan University (1983-87) gave Schnobrich a chance to score the equalizer in the title game. Burke said, “We had a penalty called against us with 2:59 left, down 1-0. About a minute before that, Tony (Suns goalie Benson) took a shot that hit right above his knee and went down like a sack of Idaho potatoes. He got back up and stayed in. For some reason, Heartland didn’t put on much pressure during their power play. The Suns “kept coming,” at a Minnesota team that included Heartland Hockey Camp owner Steve Jensen and Michigan’s Gordie Roberts, a member of the U.S. Hockey Hall of Fame. A 1976 U.S. Olympian from Michigan Tech, Jensen played 438 NHL games from 1976-82. Named for Gordie Howe, the 56-year-old Roberts came out of Michigan to become a two-time Stanley Cup winner for the Pittsburgh Penguins with 1,097 NHL games from 1979-94. Goalie Benson (32 saves) was the winning goalie Sunday, ending up with a 4-0 record in Tampa. “Tony got better and better each game,” Burke said. 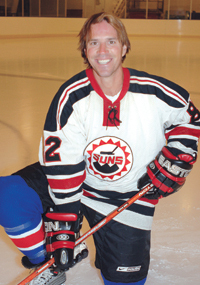 The 17-player Sun Valley roster in Florida featured former Suns skaters Dave Reichel, Dave Hutchinson, Brad Dredge, Dale Johnson, Banjo Williams, Tom Maroste, Miller, Benson and goalie Bobby Farrelly. Returning for the Suns was native Montreal skater Randy Velischek, 52, who played 10 National Hockey League seasons from 1982-92 for three teams including the Minnesota North Stars. A newcomer was Duluth’s Bucky Letourneau. Also back were Winnipeg native Doug Baran, 50, a former minor league pro at Tulsa and Peoria who played extensively I Europe, along with Tony Trace and Lester McKinnon. A first-time was New Englander Bill Henderson, a frequent Sun Valley visitor with Farrelly’s East Coast Gutter Snipes teams. The forward lines were Reichel, Moree and Miller; Schnobrich, Letourneau and Trace; and Hutchinson; Hutchinson, Dredge and Henderson. The six Suns defensemen were Maroste, Johnson, Velischek, McKinnon, Baran and Williams. On Thursday, Benson beat New England Polar Bears 5-3 and assured the Suns of a Final Four berth Friday with a 6-4 win over Easton from Chicago. Both games featured Suns empty-net goals at the end to account for the two-goal margins. Henderson scored twice and Dredge once against New England. Henderson, Reichel, Moree, Baran, Velischek and former Vail skater Letourneau each scored in the Easton game. Ketchum’s Bobby Farrelly got the nod as goalie in Sun Valley’s third game against Heartland Hockey Camp Saturday morning. Coach Burke said that Farrelly gave the Suns a great effort in a 3-2 loss that merely determined seeding for Saturday night’s semi-finals. “Tony played the first eight minutes just to get a look at Heartland, then Bobby came in and made all the big saves,” said Burke. Scoring goals were Hutchinson and Letourneau. In the semi-finals, Benson backstopped the Suns to a 4-1 victory over No. 2-seeded La Palestra Road Warriors from the New York City area. Meanwhile, Heartland Hockey Camp from Deerwood, Minn. earned its title game berth by a 4-1 count over IMS. Those semi-final outcomes set the stage for Sunday’s championship game drama—quite a difference from Sun Valley’s 8-1 title game win over Old Tyme last April. Prior to Sunday’s title game, Sun Valley hadn’t beaten Heartland Hockey Camp in each of the last two national tournaments. Last year, the Suns lost 4-2 in pool play to Heartland Hockey Camp, but snuck into the playoffs where Sun Valley dominated. The Suns then ousted North Carolina 2-0 in the semi-final and trounced Old Tyme from western New York State 8-1 in the championship game. Suns tournament games this year were played at the Ice Sports Forum and Ellenton Ice Sports Complex in the suburban Tampa cities of Brandon and Ellenton, along with Tampa Bay Skating Academy. Coach Burke, a longtime PGA golf caddie, traveled from Florida up to South Carolina where he is working this week with 21-year golf pro Tim Herron, 44, of Wayzata, Minn. at the $5.8 million RBC Heritage tournament at Hilton Head. Herron, who played golf at the University of New Mexico, has played 500 PGA Tour events with four victories, two coming in playoffs. His career earnings are over $18 million, and he has made the cut in three of five events this season. Burke and Herron will move on to the Zurich Classic in New Orleans after the April 14-20 tournament in South Carolina. 1—Sun Valley 4-1-0 (19-12 goals against). 2—Heartland Hockey Camp 4-1-0 (18-10). 3—La Palestra Road Warriors from New York 3-1-0 (14-12). 4—IMS from Washington, D.C. 2-2-0 (15-14). Also, Team Sten 1-2-0 (12-13), Easton from Chicago 1-2-0 (14-17), New England Polar Bears 0-3-0 (8-14) and North Carolina Eagles (0-3-0 (9-17). Thursday, April 10: Sun Valley 5-3 over New England; Heartland Hockey Camp 7-4 over Easton; La Palestra 3-2 over Team Sten; and IMS 6-1 over North Carolina. Friday, April 11: Sun Valley 6-4 over Easton; La Palestra Road Warriors 5-3 over IMS; Heartland 3-1 over New England; and Team Sten 6-5 over North Carolina. Saturday, April 12: Heartland 3-2 over Sun Valley; Easton 6-4 over New England; La Palestra Road Warriors 5-3 over North Carolina; and IMS 5-4 over Team Sten. Semi-finals, Saturday: No. 3 Sun Valley 4-1 over No. 2 La Palestra; and No. 1 Heartland Hockey 4-1 over No. 4 IMS. Championship, Sunday: Sun Valley 2-1 (OT) over Heartland.